French artist Sebastien Bouchard hand-painted a Louis Vuitton monogram on a calabash bowl. 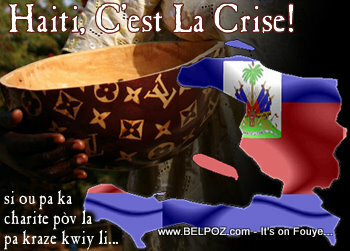 in Haiti, this would be a Louis Vuitton Kwiy. Calabash bowls used on the country side of Haiti for eating and in the kitchen, and lots of other purposes. Calabash bowls (Kwiy) are often used by beggars in Haiti. When I was a kid, my mother used to say: "Si-w pa ka charite pov la, pa kraze kwiy li." That means, if you cannot give to the beggar do not break his [calabash] begging bowl. It is interesting to see how Bouchard Juxtaposes this iconic luxury logo with a cheap third world bowl, a real contrast between the necessities of Haitian life and the desires of western society.